Remember the children's story of Goldilocks and the three bears? She wanders into a cabin and finds three bowls of porridge. The first is too hot. The next is too cold. The third, however, is "just right." I often feel like Goldilocks when tasting Pinot Grigio. Some of them are too bitter. Some of them are too sweet. Some, too tart. Some of them are too fruity. Why are wines made with this grape so often out of balance? If you're looking for a nicely balanced Pinot Grigio, look for a bottle of the 2007 Swanson Pinot Grigio from the Napa Valley. ($13-$22) Though it costs a bit more, it is very good QPR and worth every penny. Expect bitter lemon aromas, accented by a bit of blood orange. The flavors are nicely creamy yet still citrusy, like lemon curd. This wine is poised between fruit, acidity, lushness, and bitterness. As Goldilocks would say: "Just right." Pairing food and wine can be a perplexing, confusing business. People can be nutty on the subject and I have to admit I can be a bit obsessive about finding the perfect food to go with Pinot Gris and the ideal wine for spaghetti and meatballs. In a world of shrinking bank accounts and free time, I've started prizing versatility in wine. When I go to the store, I'm increasingly drawn to wine that goes with everything. What that often means is that my shopping bag contains a red blend and a bottle of Gewurztraminer. Here's why. Why Red Blends? Here in the US we tend to gravitate towards single-variety bottlings--Merlot, Cabernet Sauvignon, Syrah. 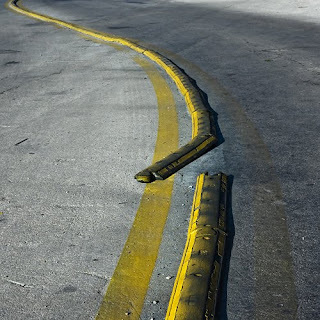 The rest of the world does things differently. Chianti is made from a blend of red grapes that includes at least 80% Sangiovese. 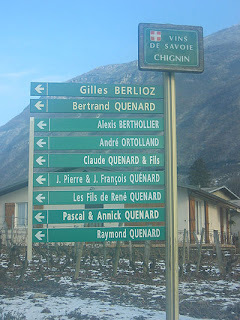 In the Rhone, red wines can include Syrah, Grenache, Mourvedre and other red grapes. Like Bordeaux reds? These bottles typically contain Merlot, Cabernet, and juice from Petit Verdot or Cabernet Franc. In my mouth, blending grapes takes some of the hard varietal edges from a wine. Put Merlot with Cabernet and some of its green pepperiness goes away, for instance. This makes red blends great food wines, capable of adapting themselves to a variety of cuisines--from burgers to roast chicken to beef curry. In the US, many red blends feature Zinfandel and Syrah. This makes them smooth to drink, and a bit higher in alcohol levels than those from Europe so read your labels! 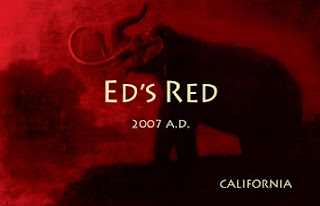 One nice red to try is the 2007 Adastra Ed's Red ($15). This big, yummy, smooth red blend is comprised of 43% Syrah, 39% Zinfandel, 13% Petite Sirah, 4% Cabernet Franc, and 1% Petit Verdot. Made with organic grapes (see note below), it has abundant notes of dark chocolate, plum, and black cherry in the aromas and flavors. This wine is not only very good QPR--it goes own VERY easily too, so remember it's 15% ABV. Pair it with anything from soups, stews, burgers, spaghetti, pizza, roast chicken with rosemary, pork tenderloin, beef curry--let your imagination fly. NOTE: the nice folks at Adastra tell me that because this is a blend, the mix is not made exclusively from grapes grown in Adastra's organic vineyards. Why Gewurztraminer? When I started thinking about this post, I was planning on extolling the virtues of Sauvignon Blanc. That's a versatile grape, too. But Gewurz edges it out, in my opinion. That's because it pairs beautifully with Asian cuisine--Thai, Chinese, Japanese, even Indian. It also is perfect with pork, sausage, and chicken. So whether you've got some delicate sushi or a hearty Alsatian pork stew, a flavorful Thai curry or a plateful of sausages and mashed potatoes, Gewurztraminer turns out to be a surprisingly good option. Gewurztraminers can be made in a dry or slightly off-dry style, so look at the description on the label. The spicier your food, the better it can handle a bit of sweetness in the wine. The most versatile Gewurztraminers, I find, are the dry ones. One I enjoyed recently was the 2007 Joseph Swan Vineyards Gewurztraminer from the Russian River Valley's Saralee's Vineyards ($20, domaineLA). I loved this domestic Gewurztraminer with its classic, restraind flavor profile. Elegant apple and white nectarine aromas lead into flavors that are almost steely in their intensity and dominated by apple and stone. The aftertaste tends towards nectarine, but this wine is by no means sweet. It was lovely with a tamarind chicken curry, with some sausage, and with a pork stew. Excellent QPR. Do you have other suggestions for wines that go with most everything? If so, leave them in the comments. Full disclosure: I received the red blend as a sample. Can Woman Live By Wine Alone? One of the impediments to blogging in the past few weeks was simply this: I had become a bit tired of wine. There were nights I felt like if I drank another "basic red" I was going to scream. I dipped into my tiny cellar, looking for wines that might inspire and turn this trend around, but had no luck. Everything I tasted seemed a bit blah and predictable. I turned to water. I developed quite an addiction to Honest Tea (and have a growing collection of the lids printed with inspirational sayings to prove it). Then, reminded of happy, relaxing times in England that were accompanied by drinking hard cider, I turned to fermented, alcoholic apple juice. That did it. My palate and mood lifted. Aspall Organic Draft Cider ($6.99 for 500ml, Whole Foods) is, in my opinion, the alcoholic non-grape beverage for wine lovers. It has a rich, fermented taste that is not as overwhelmingly earthy and pungent as some ciders in the market, a nice fizziness that makes it good with many of the same foods that go well with sparkling wine, and leaves your mouth full of the crisp taste of English apples. It is also relatively low in alcohol compared to most table wines at 6.8% alc/vol. And for the price, it's certainly excellent QPR. If you want to try something new, get yourself some Aspall Cider and make this delicious pork stew to accompany it. It's full of apples, parsnips, and pearl onions (confession: I used the frozen kind because life is too short to peel pearl onions), with some sage, shallot, and mustard for zing and lots of hard cider enriching the sauce. This is a one-pot, all-inclusive meal that is comforting and rich without being heavy. It simmers on the stove for hours, too, which makes it perfect for entertaining or just filling your house with the fragrance of autumn on a cold winter day. Of course, if hard cider is just a no-go zone for you, this recipe would be equally nice with an appley, unoaked Chardonnay, a dry Riesling or Gewurztraminer, or a light red from the Beaujolais. Don't eat pork? 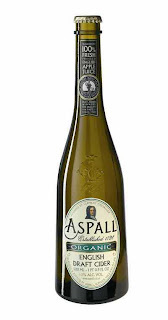 Try Aspall's Cider with a Welsh Rarebit, perhaps sliding some apples under the cheese sauce before you broil it. For a grape I've never heard of before, Jacquère certainly has a lot of synonyms and variant spellings. Where is the Savoy, you ask? It's tucked up next to the Alps. And though the region makes good wine, most of it never leaves the area's fondue parties and ski lifts. Nevertheless, I've been trying to get to know the wines of Savoy a bit better, and while they can be hard to find they tend to be very good value when you manage it, and pair nicely with food, to boot. The wine was surprisingly hard to describe based on the usual fruit and flowers vocabulary. Instead what I tasted was "clean," followed by "snow." It was very fresh tasting, with faint, pure lemon and mineral aromas and flavors if you dug under the clean snow to find them. For under $13, this was excellent QPR. What to have with your Alpine Jacquère? Something gooey and cheesey (fondue, grilled cheese, Croque Monsieur) would be lovely. But if you really want a treat, pair it with shellfish. That's what we did recently, when we stopped into the Four Seasons Biltmore Resort on the Santa Barbara coast in Montecito. They have a Thursday night seafood buffet that is a far cry from most sad buffets you are now thinking about with horror. The Biltmore's tables were loaded with fresh shucked oysters, snow crab legs, sushi, lobster, and grilled fish. And they don't charge corkage at the Thursday buffet, so I brought along this bottle and the clean-tasting wine was just perfect with the clean-tasting shellfish. All in all, an excellent value in food and wine in pricey Montecito. Sitting by the ocean on a beautiful Santa Barbara night, sipping Alpine Jacquère, all I could hope for was that somewhere in Savoy someone was cuddled up to the fire keeping warm with a nice bottle of Central Coast Pinot Noir! It's almost V-Day. Nothing says romance like some bubbly, and even if you are alone this Valentine's Day, don't you deserve to treat yourself to some sparkling wine? Sparkling wine is great for winding down at the end of a long day, it's not too bad with dark chocolate, and it is fantastic with fried comfort foods (potato chips, french fries, and fried chicken to name a few). If you're in the market for some affordable sparkling wine, I've got a rundown of some of my preferred bottlings from all over the world that cost between $14 and $23. Bubbly wines may be romantic, but nothing says forever like a nice retirement account, so put the money you would have spent on Champagne into the bank and try one of these instead. N.V. Freixenet Cava Elyssia Pinot Noir Brut. ($18) This lovely packaging contains a very nice bottle of Spanish sparkling wine made entirely from Pinot Noir. A beautiful dark rose in color, there are aromas and flavors of strawberries, cucumbers, and a touch of mint. This sparkler is fresh tasting, yet round and lush, too, with nice body. Good with chocolate, pasta with vodka sauce, or salmon. Well worth the price, and excellent QPR. N.V. Cupcake Vineyards Blanc de Blancs. ($15.99) A well-made, 100% Chardonnay sparkling wine, with lots of citrus, apple, and some bread dough notes. The wine's refreshing, mild flavors make it an excellent choice for a pre-dinner sipper, or to go with simply prepared fish or chicken. Very good QPR. N.V. Pongrácz Brut. ($14.99) An interesting sparkler from South Africa made from Pinot Noir and Chardonnay, this wine has toasted bread, apple, and cherry pit flavors. Some may find the bubbles are a bit harsh and raspy, but it is very refreshing and would also be excellent if you are making mimosas or other cocktails that need sparkling wine. Try floating a hibiscus flower in it, with a dash of the syrup from the bottle. It looks beautiful! Very Good QPR. N.V. Jansz Premium Cuvée ($22.95, Bristol Farms; available elsewhere for $16-$24) An elegant, creamy sparkling wine from Tasmania, with lots of apple in the midpalate. The wine had a lovely mouthfeel, and would partner well with creamy sauces. Made from Chardonnay with a bit of Pinot Noir. Very good QPR. N.V. Mumm Napa Cuvée M ($20) I was VERY impressed with this $20 domestic sparkler. It had a depth of flavor that I usually find lacking in cheaper sparklers which are all bubbles and citrus and not much else. Made in a barely sec style, from Pinot Noir and late-harvest Muscat, this wine has aromas of white chocolate, toasted bread, and strawberry followed by layered flavors of white chocolate, rose petal, Meyer lemon, strawberry, and toast. Pretty great stuff. Excellent QPR. Full Disclosure: with the exception of the Jansz, I received all these wines as samples. Prices given are suggested retail, and you may find that the wine costs more or less in your area. Clicking on the wine's name will take you to one of various wine search engines in case you would like to purchase the wine near you. It's snowing on the east coast, raining on the west coast, and wintery everywhere in between. Nothing suits this kind of weather better than Cabernet Sauvignon, and I've been tasting my way through a nice selection of Cabernets and Cabernet blends in pursuit of the perfect wines to complement soups, stews, and braises. If you're looking for a red wine to warm up your winter evenings, look for one of these in a store near you, and try out some of these great recipes while you're at it! 2008 Bodegas Osborne Cabernet-Tempranillo Tempra Tantrum. ($11.99) Tempra Tantrum is a new line of Tempranillo-based from the people at one of Spain's oldest and most venerable wineries. This blend is hip, young, and cheerful (just like its maker!) Made in a modern style, the cherry and leather aromas are a nice prelude to a bright, cherry core with some blackberry depth in the midpalate. Made from 60% Tempranillo and 40% Cabernet, this juicy, fruit-forward wine would be great with grilled lamb dishes or paella--or with a zesty chicken chili. Very good QPR. 2007 Luigi Bosca Cabernet Sauvignon Finca La Linda. ($11) I liked this distinctive Cab from Argentina, with its blackberry and plum blossom aromas. There was a decided note of cigar box in the flavors, along with cherry and plum. The wine's smooth, satiny mouthfeel was accompanied by a mocha-inflected finish. Excellent QPR for those who like traditional, earthy Cabernets. 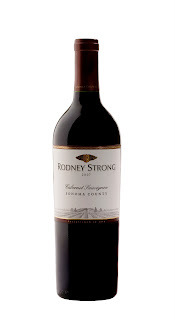 2007 Rodney Strong Cabernet Sauvignon Sonoma County. ($17) This juicy, fruit-forward wine has lots of spice and pepper, which helps it to stay focused. There are abundant, cherry, licorice, and smoky aromas and flavors which makes for an approachable Cab, especially for those who like traditional flavor profiles. Try it with this excellent slow-cooked beef minestrone soup my dad introduced us to. Very Good QPR. 2007 Blackstone Winery Sonoma Reserve Rubric Sonoma County. ($22.99) A wine blended from Cabernet, Malbec, Cabernet Franc, Petite Verdot, Tannat, Merlot, and Petite Sirah it had smoky cherry aromas and a deeper, plummy flavor spectrum. The wine was made brighter with crisp white pepper notes that continued into the aftertaste. Very good QPR, even though the suggested retail is a tad over $20. 2007 Robert Mondavi Winery Meritage Private Selection. ($11) This Bordeaux-style blend of Cabernet, Merlot, Petite Verdot, Malbec, and Cab Franc has classic notes of tar, currant, and leather in the aromas. All these lead in to a red currant flavor, which opens up to richer plum and pepper. Give this bottle some time in the decanter, and you'll be very pleasantly surprised. Buy two bottles and make some braised short ribs. Excellent QPR. 2006 Rancho Zabaco Cabernet Sauvignon Dancing Bull. ($12) I'd already tasted this wine last February when it was at an earlier stage of its life cycle. A year on, this tasted quite different. Meaty, cherry aromas led to flavors of cherry, oak, blackberry, and a bit of baker's chocolate in the aftertaste. There is nice grip in the end, although the wine tastes quite smooth when it first hits your tongue. Very good QPR. Full Disclosure: I received all these wines as samples. All prices given are the suggested retail prices. You may find them for less in your market. Clicking on the name of the wine will take you to various wine search engines, in case you are looking to buy a bottle near you. Since that time I've heard from some of you who asked if I was ok (I am--just inconceivably busy), and others who wanted to know what's up (a lot, actually, but nothing that I wish to disclose here and now!). While I was away, the comments sections for various posts were filled by interesting contributions from people selling all nature of things (I deleted the ones I found). All over the 'net, other wine bloggers wrote thought-provoking posts that I never managed to comment upon, though I did read them. And I was gratified and amazed that people actually bought the Pinot Noir I recommended in my last post and took the time to actually tell me that they were pleased with the purchase. Against all odds, I did manage to carve out several hours to write blog posts this morning so you will be seeing some new content. Fingers crossed, this will be possible to do for the foreseeable future. If I drop out of sight again, please be patient and hang in there. I'll be back. And stay tuned for posts on Monday and Wednesday.